SEATTLE, WA (FEB 16, 2017) — It has been announced that the 2017 Experience Hendrix Tour (EH), the multi-artist traveling celebration of Jimi Hendrix's music, will provide sound check access to students from 14 School of Rock (SOR) locations, spread out across 11 tour stops. Fender will award each participating SOR a Fender Jimi Hendrix Stratocaster® guitar. Fender is a long-time tour sponsor of the Experience Hendrix Tour and has partnered with EH for philanthropic endeavors for many years. 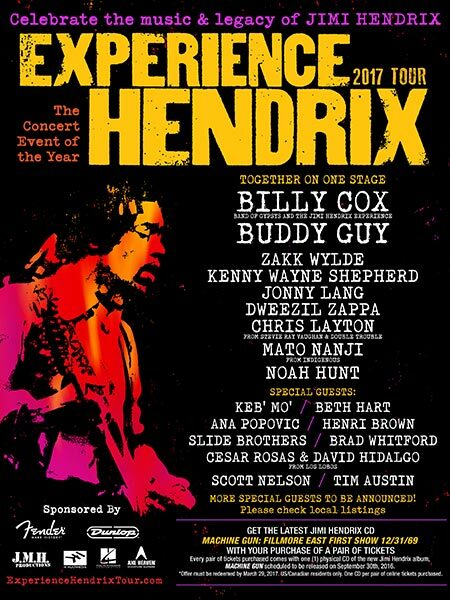 The 11th edition of the Experience Hendrix Tour, totaling 29 dates in February and March, will be the most extensive one yet, featuring a diverse array of artists, such as blues legend Buddy Guy, Black Label Society and former Ozzy Osbourne guitarist Zakk Wylde, Jonny Lang, Kenny Wayne Shepherd, Dweezil Zappa, Aerosmith guitarist Brad Whitford, David Hidalgo and Cesar Rosas of Los Lobos, Keb' Mo', Doyle Bramhall II, Ana Popovic, The Slide Brothers, Mato Nanji from Indigenous, Beth Hart, and Jimi Hendrix Experience/Band of Gypsys bassist Billy Cox. "Jimi Hendrix songs have been played by thousands of School of Rock students all over the world," says Jason Kline with SOR in Elk Grove and Roseville, CA whose pupils will be attending the Feb. 22 tour stop at Mondavi Center in Davis, Calif., along with students from its Elk Grove sister SOR. "Every year, many of our students perform Jimi Hendrix shows live in their local community. Jimi Hendrix posters, artwork, album covers are seen in almost every school coast to coast. He is so important to us. Owners of School of Rock come from all different backgrounds, but we have one thing in common — very deep passions for music and education. Our owners and staff feel incredibly fulfilled by the impact we're having on kids and our communities. We are so thrilled that the Experience Hendrix Tour is offering this wonderful experience to our students. Together, we can make a difference, we can help young and aspiring musicians define themselves and develop the tools they need to rock on stage and in life." Fender, creator of the iconic Stratocaster guitar popularized by Jimi Hendrix, is proud to enable music among a new generation of players through Experience Hendrix Tour and School of Rock. "Jimi Hendrix used his Stratocaster to tell stories, creating sounds musicians never knew were possible," said Evan Jones, CMO of Fender. "As one of the world's largest musical instrument manufacturers with a storied 70-year legacy — we have a responsibility to support all players at any stage of their musical journey, and that includes the next generation. Now, students at School of Rock can further explore Jimi's legacy and playing-style with a Jimi Hendrix Stratocaster, which features signature touches based on his distinctive "flipped-over" guitars." Janie Hendrix, CEO of Experience Hendrix, L.L.C. and sister of Jimi Hendrix is delighted to be involved; she will personally hand out the Fender Stratocasters to each participating School of Rock. "Jimi's music transcends generational boundaries. He graced us with his gifts during his short time here as young people the world over continue to receive those gifts. The School of Rock honors my brother by teaching his music, and we love honoring them by giving back any way we can."